Snow Pants, Mittens, Hats . . . ELA? Yes! Antioch University will host three In Bloom conferences this spring. 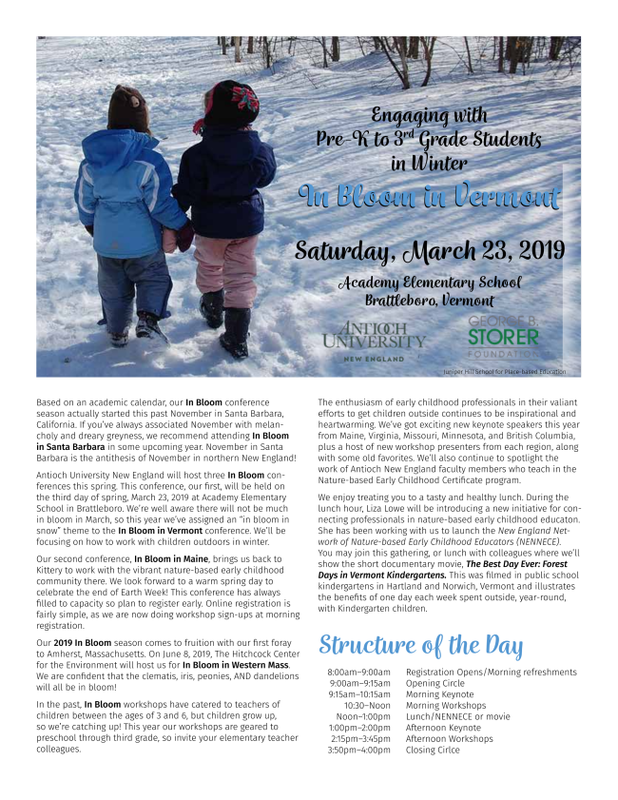 The first, In Bloom in Vermont, will be held on the third day of spring, March 23, 2019, at Academy Elementary School in Brattleboro. We're well aware there will not be much in bloom in March, so this year we've assigned an "in bloom in snow" theme to the In Bloom in Vermont conference. We'll be focusing on how to work with children outdoors in winter. Our second conference, In Bloom in Maine: Promising Practices in Nature-based Early Childhood Education brings us back to Kittery, Maine, to work with the vibrant nature-based early childhood community there. We look forward to a lovely warm Spring day to celebrate the end of Earth Week! This conference has always filled to capacity, so plan to register early. Our 2019 In Bloom season comes to fruition with our first foray to Amherst, Massachusetts. On June 8, 2019, The Hitchcock Center for the Envioronment will host us for In Bloom in Western Mass. We are confident that the clematis, iris, peonies AND dandelions will all be in bloom! In the past, In Bloom conferences have catered to teachers of children between the ages of 3 and 6, but children grow up, so we're catching up! This year our workshops are geared to preschool through third grade, so invite you're elementary teacher colleagues. What happens when Kindergarteners start spending more time in the wildspaces beyond the school building? Many things, of course. Inspired by Kindergarten Forest Days, children across the grades in some Vermont elementary schools are spending significantly more time outdoors. Woven together from the reflections of teachers, Eliza brings you the story of the Forest Day movement and the effect it is having beyond it's kindergarten roots. Eliza Minnucci was raised in Deerfield, New Hampshire but now calls Tunbridge, Vermont home. Before teaching Kindergarten in Quechee, she taught young children in Zihuatanejo, Mexico, Chicago, Seattle and Fort Yukon, Alaska. On hiatus from the kindergarten classroom, she supports teachers in cultivating nature-based play and learning for their students through consultation and teaching the Natue-based Early Childhood curriculum course at Antioch University New England. She is a frequent presenter at In Bloom conferences throughout New England. She is the author, with Meg Teachout, of A Forest Days Handbook: Program Design for School Days Outside, published in 2018. Lunch is included in the cost of registration. We try to provide a tasty, healthy lunch that allows for common dietary restrictions. In the main dining area we will screen the short documentary movie, Best Day Ever: Forest Days in Vermont Kindergartens. Also, Liza Lowe will be facilitating a conversation about the New England Network of Nature-based Early Childhood Educators. This is an opportunity to connect with other regional early childhood professionals. Liza Lowe, Wild Roots Nature School, Chesterfield, NH and Adjunct Faculty, Antioch University New England. The New England Network of Nature-based Early Childhood Educators (NENNECE) has formed in response to a growing interest in nature-based education. The purpose is to provide a network for early childhood educators throughout New England to connect with one another, share ideas and resources, and support each other in providing high quality nature-based learning opportunities. Interested in collaborating with like-minded colleagues? Curious how to start a group in your neck of the woods? Join us as we explore ways to grow NENNECE and further organize our New England network. What happens when something in the natural world piques children's curiosity, and teachers notice and respond? A curriculum adventure emerges that links seasonal changes, day and night, work and play, science, literacy and more. Anne's story of an owl study began when a five-year-old brought in a book about owls that his grandmother had given him. The children spontaneously began to play a game called "owl families getting ready for winter." The classroom came alive with the buzz of questions: Where doe the owls go in the winter? What owls live here in Maine? How do owls eat? Anne Stires is the founder, director, and lead teacher at Juniper Hill School for Place-based Education in Alna, Maine. She has worked with AUNE on In Bloom conferences since their beginnings, and serves as adjunct faculty in the Nature-based Early Childhood Certificate Program. She is a contributing author to Nature Preschools and Forest Kindergartens: The Handbook for Outdoor Learning.